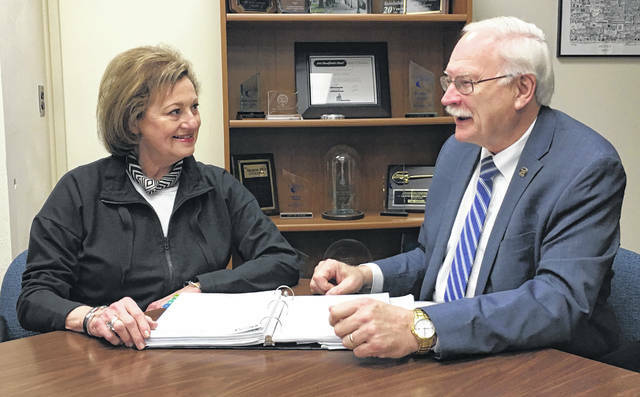 Sidney Tree Board Chair Ann Asher and Mayor Mike Barhorst recently met to discuss the types of trees that are appropriate to be planted within the city. SIDNEY — The city of Sidney was named a 2019 Tree City USA by the Arbor Day Foundation. The announcement, made in advance of the April 29 celebration of Arbor Day, honors the city’s commitment to effective urban forest management. This marks the 29th consecutive year that Sidney has received this honor. To achieve Tree City USA recognition, cities must meet the program’s four requirements. Those requirements include: an active tree board; a tree-care ordinance; an annual community forestry budget of at least $2 per resident; and, an Arbor Day observance and Mayor’s proclamation. The Tree City USA program was begun in 1976. Started by the Arbor Day Foundation, the program partners with the United States Forest Service and the National Association of State Foresters. Sidney’s five-member Tree Board was created by the City Council in April 1989 to develop, annually update, and administer a written plan for the care, preservation, pruning, planting, replanting, removal, or disposition of trees and shrubs in parks, along streets, and in other public areas. The current members include Ann Asher, Michael Jannides, Ross Moore, Anne Sharp and Rick Steenrod. “Trees provide multiple benefits to our community when they are properly planted and maintained,” Brian Green said. “They help to improve the visual appeal of neighborhoods, increase property values, reduce home cooling costs, remove air pollutants, provide habitat for wildlife, and a host of other benefits.” Green is an ISA Certified Arborist and Sidney’s street superintendent. Ann Asher, Sidney’s longest serving member of the Tree Board and current chair, was also enthusiastic about trees. “Following the tradition of recent years, the city of Sidney will plant a tree on the campus of one of the local schools on Arbor Day,” Green said. Green is Sidney’s liaison with the Tree Board. The Arbor Day Foundation is a million member nonprofit conservation and education organization with the mission to inspire people to plant, nurture and celebrate trees. Additional information is available online at arborday.org.